Should I Buy A Home Or An Investment Property? Should I Buy A Home Or An Investment Property? Should you buy a home or an investment property? This is a very personal decision to make and there a pros and cons to both choices. What should you do? Should you buy a home or an investment property first? There are pros and cons to buying both your own home first versus buying an investment property first. And I want to cover some of the benefits of each in today’s video. As well as go in and help you try and make this decision for yourself. Because the truth of the matter is, this decision is a personal one and depends on your goals and your particular circumstances. Hey, I’m Ryan from onproperty.com.au, your daily dose of your property education and inspiration. So, let’s go ahead and get started. I’m going to start with the reasons to buy your own home because most people tend to lean towards buying their own home first. The first reason is security. Buying your own home, you have the security of place where you’re at. You’re not going to be in a rental where the owner is going to decide to sell and kick you out or they’re going to decide to up your rent. You are the master of your own fate in this circumstance, apart from fluctuating interest rates. So that aspect of security is really important to a lot of people and should not be overlooked. I know in my personal circumstance, security is massively important to my wife. Not so much to me because I feel like I always fall on my feet but for her, she wants to have that level of security and so leaning towards buying your own home first is a big thing for her. The second thing is you’ve got locked-in pricing in the area. So, as we know, properties tend to go up and up and up over time and rents go up and up and up as well. So, by buying a property in the area that you want to live in, you know the price of that property isn’t going to change. Interest rates may change but the price isn’t going to go up because you already bought it and you own it. So, this means as rents go up over time, chances are, your mortgage or payments are going to be going down as you pay off your mortgage and so that puts you in a better financial position. Another reason is that you can have your home the way you like it. So you can put a deck, you can put a pool, you can paint it the colors you want. When you’re in a rental property, you don’t have the sort of flexibility that you likely want to be able to have the home exactly the way you want it. Now, if you own your own home, you can do that. Which leads to a better standard of living. The fourth reason is that we’ve told it’s the best thing to do. We’ve been told, “Go out there, go to college, get a good job and buy your own home and pay off the debt”. We’ve been told that debt is bad; we’ve been told that paying rent is bad. And so, often, we just lean towards buying our own home because that’s what we’ve been told to do. Another benefit of buying your own home is that you can actually improve the property while you’re living in it. Which can improve the value of that property and give you equity, which you can access to then go ahead and buy more properties, buy investment properties and improve your financial situation that way. This is one of the things that I love about buying your own home, is that you can take your time to improve it while you’re living in there. Reason number six is that you don’t want to pay dead money a.k.a. rent, and this is understandable. If you’re paying $400 per week rent, that’s $20,000 per year that you’re paying to someone else in order to live in their home. So it’s understandable that you’d want to get out of paying someone else dead money and you’d want to put that money on to a property that you can improve, a property that will hopefully increase in value and become an asset to you. And also, you can save on capital gains tax, which is a major benefit of owning your own home. However, a lot of people don’t realize that if you buy a home and if you live in it, if you decide to move out, you can actually keep that property as your principal place of residence and rent it out for up to 6 years without paying any capital gains tax. Obviously, speak to a professional, speak to a taxation adviser if you’re going to go ahead and do this. But, yeah, a lot of people don’t know that you can actually still save on capital gains tax if you’ve lived in the property previously. So, there’s many benefits to buying your own home. But now I want to go ahead and look at reasons to buy an investment property. So, on the flipside, buying an investment property can also be a great decision. And in many circumstances, it can be a better financial decision than buying your own home. However, I’m not saying that it’s better. Because sometimes, buying your own home is actually the better financial decision to offset the rent, you can improve the property and so forth. Anyway, let’s have a look at some of the reasons to buy an investment property. The first reason is that you just simply can’t afford to buy where you want to live. You might want to live in a nice area but you can’t afford to buy there. And so you could go further out of your capital city or you could look in regional areas or you could look somewhere else or you maybe could buy a small unit that wouldn’t be suitable for you to live in. But basically, by buying an investment property, you can spread yourself out over the country because you can look at properties that you can actually afford to buy and you can continue to rent and live where you want to live. Another reason to buy an investment property is that often you can have an increase borrowing capacity when you buy an investment property. And the reason this is, is when you buy an investment property, the banks are actually going to take some of that rental income into account and which adds to your serviceability, which adds to the amount of money that the banks are willing to lend you. Go and see a mortgage broker, talk to them about the differences between buying your own home and buying an investment property and seeing how much you can borrow. But because you’re getting an income coming in from that investment property, then that can help you borrow more money, which can help you buy multiple properties or can help you buy your own home and an investment property. So that is definitely something to be considered. Another reason to consider buying an investment property is the debt on the property is actually tax-deductible debt. Because that property is generating you an income, the expenses that come with that property are generally tax-deductible and this includes the interest repayments on your mortgage. However, if you own your own home, then the mortgage that you have on that and the debt that you’re paying on that isn’t tax-deductible. So an investment property can be great in terms of taxation because that tax-deductible debt can sometimes help you to pay less tax. Another reason is that when you buy an investment property, you can target high-growth or positive cash flow areas. If you’re looking for a home to live in, then obviously you’re going to be very specific to the suburbs that you want to live in and you aren’t going to be as focused on buying in a high-growth area or buying in a positive cash flow area. So when you’re buying an investment property, you can actually target areas that are more likely to grow or you can target areas that generate a positive cash flow and a passive income from you, for you. So you can look at a broader range of areas and you can actually develop an investment strategy to move you towards your financial goals. And another benefit of buying an investment property is that you get increased flexibility. One of the things that has stopped me from buying my own home is that I need that level of flexibility. I have relocated from Sydney, to New Castle, to the Central Coast and then to the Gold Coast. So, that’s 4 relocations and I’ve moved house about 14 times. I’m about to add a third member to my family. My situation is changing extremely quickly. And so, by not owning my own home and being locked in to my own home, I’ve got more flexibility to move where I want to move and to change properties as my circumstances change. So that’s something to consider as well. If you buy an investment property, then you’ve got the increased flexibility of where you live, where you work, what kind of property you live in and you can move around and, you know, you can be more flexible with that. You can go overseas and travel for 6 months. Because your property’s going to be rented out, you don’t have to worry about paying the mortgage on that property for 6 months. Because, hopefully, the renter is paying you enough money to cover those expenses. So there are some reasons to buy an investment property. Now, I want to go in to help you decide whether to buy a home or whether to buy an investment property. So we’ll take some benefits of buying each, some benefits of buying your own home, there’s benefits of buying your investment property. But how can you actually work out what is going to be best for you? Well, the first thing I suggest you do is to imagine your life 20 years down the track. The decisions we’re making today aren’t just decisions for today but they are decisions for the future and they are going to impact our future. So what I find really useful when making big decisions like this is actually to project forward 20 years in the future and to imagine what our life is going to be like. Whether we bought our own home first or whether we bought an investment property first. What’s it going to be like in 20 years if we bought our own home? Maybe our home will be completely paid off and we won’t have a mortgage to pay so our expenses will be less but we won’t have any income coming in and so that’s going to, you know, affect our life and mean that we still need to have a job and stuff like that. If we bought an investment property, well, chances are that we’re probably going to pay down the debt on that across 20 years and but we’re also going to have an income coming in from that property and a rental income coming in from that property. That property may have gone up in value as well, which we could draw equity on. And so, looking 20 years in the future can be really helpful for you. If you have your own home, you know, less expenses. If you have an investment property, you could have a passive income coming in. So just look 20 years down the track and say, “Well, if I bought an investment property, where would this lead my life? And if I bought a house, how will this change the trajectory of my life?” I find that a very useful scenario to go through and it really makes more clear what decision you should make for yourself. You also need to weigh up the benefits of the security of owning your own home versus the flexibility and the potential to gain some financial freedom from owning an investment property. Buying an investment property isn’t going to deliver you financial freedom right off the bat, even if you buy a positive cash flow property. 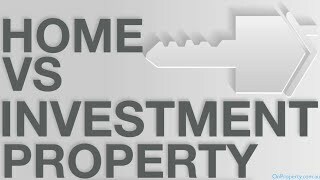 But over time, an investment property will generate you a passive income and that will give you more flexibility. Not just to move around, but you’ll actually got income coming in so could afford probably to take a low-paying job or a part-time job or if you build up your portfolio enough then, eventually, you might be able to quit your job altogether. But not having the security of your own home, knowing that rents will go up, knowing that you can get kicked out of the home if the owner decides to sell or decides to move in themselves is something you need to consider as well. So, weigh out the security versus the flexibility and the potential of financial freedom and see what’s more important to you. And obviously, you’re going to take risks on both sides of the equation. So, what’s more important to you and what is worth taking the risk for? It’s also good to ask yourself, “Is this going to be my dream home?” We talk about buying a home versus buying an investment property. But rarely is the first property we purchase our dream home. Rarely does it deliver us exactly what we want in a home and so, eventually, we’re going to turn around and sell that property or we’re going to keep that property as an investment property and we’re going to move somewhere else that is closer to our dream home. So, ask yourself, “Is this my dream home?” Look, if the answer is “yes”, then maybe it’s going to be better for you to buy your own home. If the answer is “no”, well then you need to consider the fact that down the track, you’re likely going to be either selling this property or this property is going to turn in to an investment property. And then you need to consider some things that investment property buyers would be considering. Like, “Is the are going to grow? Is it a good area for renters?” etc, etc. So, assessing whether this is your dream home or not can also get you away from “I need that security, I need my own home” and you can say, “Well, actually, it’s not my dream home. How can I move to get my dream home faster?” Is it going to be better to buy a home that’s not my dream home now or is it going to be better to buy an investment property? Is that going to get me to my dream home faster? You can also ask yourself, “How can I do both?” One of my favorite authors is a guy called Robert Kiyosaki who’s the author of Rich Dad, Poor Dad, The Cash Flow Quadrant and many other great books. And he says, questions define your life. And so, if you are asking the question, “Should you buy a home or an investment property?” you’re actually limiting yourself because you can only choose one of those. By asking that question, that question only has one right answer. However, if you change your question and ask, “How can I buy an investment property and my own home at the same time?” or “How can I buy a home and an investment property in the next three to five years?” Well, then, that question makes your brain think of different answers and you can potentially achieve both. You could have your own home and you could have an investment property working for you. So, sit down and ask your question, “How can I actually do both?” Don’t just accept the fact that you can’t do both and you can only do one or the other. Find a way to do both. And also, I think it’s very important that you decide on your financial and personal goals. This comes back to, you know, the security versus the flexibility and stuff like that but looking more on a grander scale. What are your long-term financial goals and what kind of personal life will that deliver for you? Have a think about that. How much passive income do you want to earn, what sort of life do you want to be living? And then think about what is actually going to get you to your financial and personal goals faster? Is owning your own home a big personal goal for you and ticking that off the list is going to be awesome. Or, is achieving financial freedom your big financial and personal goal and maybe an investment property is going to get you there faster. So, I hope that this has helped you to understand and to assess whether you should buy your own home first or whether you should buy an investment property first. If you are looking into investment properties, then I do list high rental yield properties over at onproperty.com.au/free. You can get access to ten high rental yield properties over there that are likely to generate a positive cash flow. So go and check those out if you haven’t seen them already. And until tomorrow, remember, stay positive.